So in my travels last week I had the opportunity to get through some stacked up magazines and cookbooks I had been wanting to review. 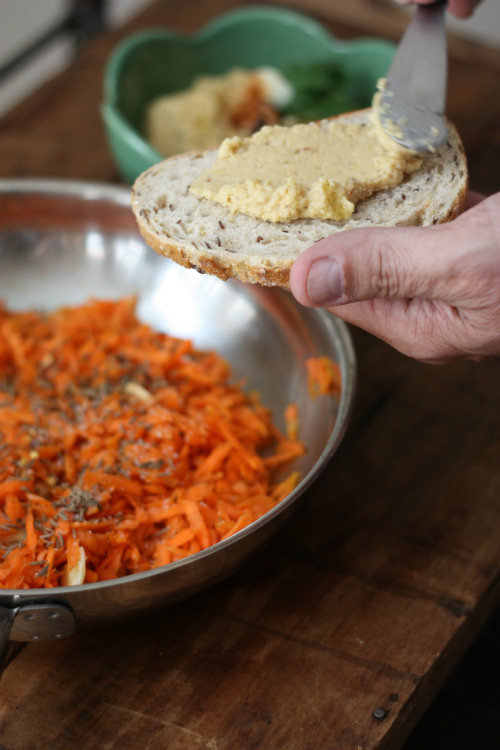 In my Food and Wine issue I came across the British chef Nick Sandler who created this vegetarian sandwich recipe for Paul, Stella, and Mary McCartney's new cookbook Meat Free Monday — hence the title Spicy Carrot Sandwich fit for a Knight. 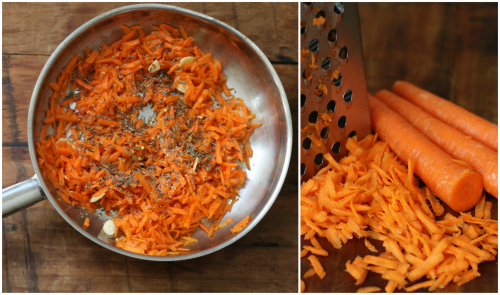 Heat the oil in a skillet and add the grated carrots, garlic, caraway seeds, and season with salt and crushed pepper. Cook until the carrots are just wilted about 4 minutes. 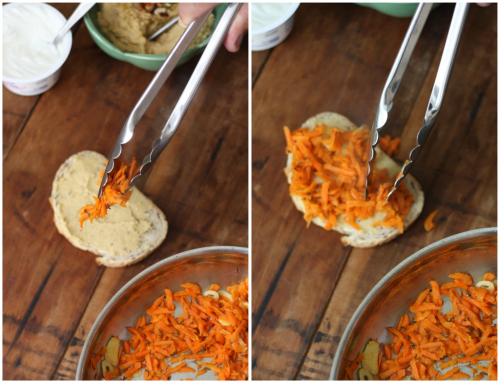 Spread 4 slices of the bread of your choice* with hummus, top with the carrot mixture yogurt, cilantro, and fresh cracked pepper. E.A.T. Tip: If you haven't tried the Organic Flax Quinoa Bread from Short Pump Whole Foods, do yourself a favor! I'm not really a huge bread person but this variety blew my mind! 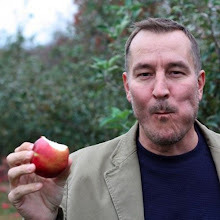 Let me tell you, you'll be singing Good Day Sunshine with the first bite. After fried chimichangas, nachos, fried fish tacos, and plenty of cerveza last week this fresh and filling sandwich was a welcome lunch on Sunday. 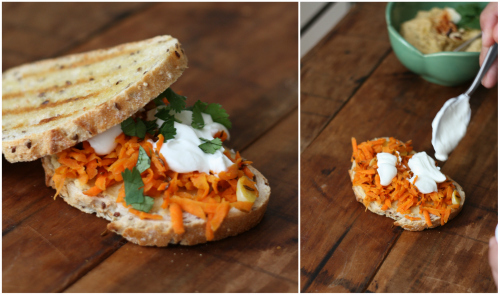 So much so that this carrot sandwich will be put in the rotation as a regular go-to lunch! Stay tuned Friday as we look at the homemade hummus I made to go with this. So after vacation and indulging for a week what is your healthful detox meal? This looks like a great lunch for my daughter, who is a huge fan of carrots and always demanding something new for lunch! Can't wait to try it. Please let me know! I am sure it will be a hit! Thanks for stopping by. Ready to detox on your next rotation! What a great idea - the hummus recipe looks easy enough for me to do. Saw your recipe on Pinterest and had to give it a try on my homemade Irish soda bread. It was DELICIOUS and refreshing!! Thanks for sharing. Thanks so much for giving it a try and homemade Irish soda bread do tell! This is a new favorite sandwich in the kitchen!